I cannot believe its officially fall. Where has the time gone?! As much as I enjoy all the perks of summer, like late evening trail runs and patio dinner dates, fall is still my favorite season. Ok, Ok, I am slightly biased since my birthday happens to be right in the thick of it but cozy sweaters? soft rain? PUMPKIN SPICE LATTES?!? come on! what's not to love? lol. Although heat waves are still coming and going here in California, slight wind chill and overcast skies are starting to creep in making me have all the fall feels. I am so excited cuddle season (and by cuddle I mean, place my dog in my death grip on the couch because he is a major brat when I want him to cuddle with me #thestruggleisreal) is right around the corner! As I mentioned at the start of summer, I have been trying to step up my casual style game and it has gotten even more essential recently for non-stop coffee dates have me needing chic but comfortable on-the-go looks that I can dress-up/dress-down and now layer for fall. Taking basics from "blah" boring to effortlessly beautiful, Skunkfunk's sustainable fashion clothing line has hit this style transition right on the nose for me. Made out of eco-friendly Lyocell, I styled this Skunkfunk faux denim dress for day of meetings that was followed by an event. 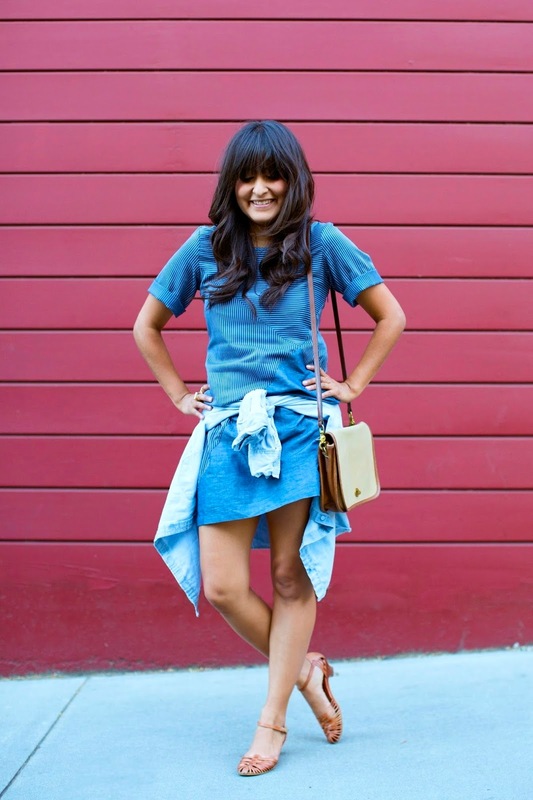 Denim on denim looks are great way to transition your wardrobe from summer to fall. The key to this style is keeping to only two pieces of denim per ensemble such as a chambray button up paired with a denim skirt or a denim jacket paired with a great pair of blue jeans. My current favorite way to do denim on denim is via the "shirt tied around the waist" trend. It was a bit of a challenge to figure out how to style it/tie it properly on my body type but I was very happy with the outcome! Happy Fall Lovelies!